Post-contrast cardiac T1 measurement has been reported to be correlated with interstitial fibrosis burden. However, post-contrast cardiac T1 can also be influenced by a variety of confounders, including: cardiac function, renal function, hematocrit, magnetic field strength, contrast agent type and dosage, and specific delayed imaging time after contrast agent administration. To compensate for these confounders, investigators have proposed to measure extracellular volume (ECV). Despite the advantages of ECV over cardiac T1, systematic studies comparing the two measurements are lacking . The purpose of this study was to compare the effectiveness of post-contrast cardiac T1 and ECV for evaluating the temporal changes in left ventricular (LV) fibrosis in an established canine model with chronic atrial fibrillation (AF). Seventeen mongrel dogs with different durations (0-22 months) of chronic AF were scanned multiple times for a total of 46 CMR scans at 3T (Verio, Siemens). Cardiac T1 maps were acquired in 3 short-axis planes (base, mid, and apex) using the arrhythmia-insensitive-rapid (AIR) cardiac T1 mapping pulse sequence  based on B1-insensitive saturation-recovery of magnetization preparation, with the following relevant imaging parameters: spatial resolution = 1.4 × 1.4 × 7.0 mm, temporal resolution = 217 ms, saturation-recovery time = 600 ms. Cardiac T1 maps were acquired pre-contrast and 15 min after a bolus injection of Gd-BOPTA (MultiHance; 0.15 mmol/kg). Blood samples were drawn during MRI for hematocrit calculation. For image analysis, myocardial contours and blood pool were manually segmented, and T1 and ECV values were calculated. LV ejection fraction (LVEF) was calculated using cine MRI. Temporal changes in post-contrast LVEF, LV T1, blood T1, and ECV were modeled with linear mixed effect models to account for repeated measurements over disease duration. Four animals were sacrificed at different durations of AF (0-22.6 months) for histologic quantification of LV fibrosis. Figure 1 shows post-contrast cardiac T1 maps of a dog with disease duration = 15.2 months, as well as LV tissue samples with Masson's trichrome staining at baseline (interstitial fibrosis = 1.0%) and 22.6 months of AF duration (interstitial fibrosis = 3.2%). 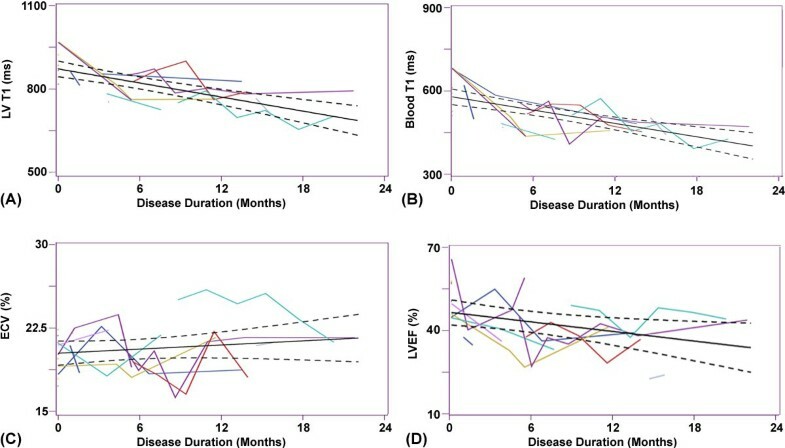 As shown in Figure 2, all four parameters (p < 0.05), except ECV (p = 0.29), changed significantly with disease duration of 22 months. Note that the temporal trends in LV and blood T1 are similar. Compared with histologic quantification of fibrosis and extracellular space, ECV agreed better than LV T1. (A) Representative post-contrast AIR cardiac T 1 maps of a dog with AF duration = 15.2 months: (left) basal (T1 = 737 ms), (middle), mid-ventricular (T1 = 708 ms), and (right) apical (T1 = 740 ms) planes, with mean ECV = 26%. (B) Histologic evaluation of Masson's trichrome staining of LV tissue (midwall) samples from the antero-lateral LV in different dogs sacrificed at different durations of AF: (left) baseline and (right) 22.6 months. All specimens displayed with 10× magnification. Plot of the estimated regression line (solid line), along with the 95% confidence intervals (dashed lines), describing the temporal changes in: (A) LV T 1 , (B) blood T 1 , (C) ECV, and (D) LVEF. All four parameters, except ECV, changed significantly with disease duration over 22 months. Different colors represent individual temporal trends. This study suggests that ECV is a more robust measure of extracellular space than post-contrast LV T1, especially for evaluating temporal changes in LV fibrosis. Ben B. and Iris M. Margolis Foundation.